Welcome to the 443rd Edition of my series. Last night was our last performance of THE GOOD DOCTOR. Thanks to a great cast and crew for making this a good and fun production. I do not know what is next as of right now but as always I will keep everyone updated. Now for what you are wanting to learn, the recommendations. 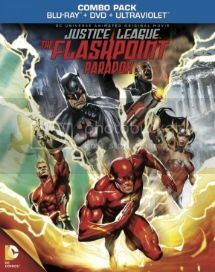 Justice League: The Flashpoint Paradox (2013): I start the week out with this animated superhero movie from the DC Universe. This movie centers around Barry Allen aka the Flash, voiced by Justin Chambers, if you had not noticed. Even with a museum dedicated to him and the many times he has stopped crime, he still feels guilty about his mother being murdered during his childhood. He finds a time to go back and save his mother but then inadvertently creates a ripple which makes a much darker world. In this world Batman, voiced by Kevin McKidd but Kevin Conroy in the modern world, is a lot darker and is more about killing his enemies. Also, Wonder Woman, voiced by Vanessa Marshall, and Aquaman, voiced by Cary Elwes, are at war with each other in a very brutal war. There is also a resistance group that have people like Lois Lane, voiced by Dana Delany, and Lex Luthor, voiced by Steve Blum. In this world, Wonder Woman and Aquaman are no better than Luther. Batman and the Flash along with Cyborg, voiced by Michael B. Jordan, look to fix Flash's mistake and get the other world back. Other Justice League members included are Superman, voiced by Sam Daly, Green Lantern, voiced by Nathan Fillion, and Captain Atom, voiced by Lex Lang. The main villain in this one is Professor Zoom, voiced by C. Thomas Howell, who has the Flash's abilities. Other voices include Grey DeLisle, Danny Huston, and Jennifer Hale. The one I missed was Martian Manhunter but I was glad to see people like Aquaman and Captain Atom who usually aren't in the animated movies. This is not really a family movie like the animated series was. This is quite dark but very compelling. I have found that some of my favorite superhero movies are these DC animated movies that go straight to video and this one is no exception. It was also really good to see something centered around the Flash and his working relationship with Batman who are pretty much partners in this movie. This has a great array of heroes and villains and is really worth a watch. Porky and Daffy (1938): I continue with this animated short that is a little more family oriented and this one centers around Porky Pig and Daffy Duck. In this short, Daffy Duck is a boxer and Porky is his manager and Daffy gets a title shot against a rooster and uses rather underhanded techniques in attempt to win. This is an early one for both of them but was a very fun boxing parody. 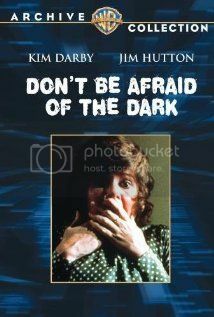 Don't Be Afraid of the Dark (1973): This is my tv movie for the week. Kim Darby and Jim Hutton star as married couple Sally and Alex. They have just moved into a Victorian mansion. Sally begins to witness strange happenings but her husband dismisses her for being paranoid and neurotic. She also has a hard time getting anyone else to believe that she has seen a group of small creatures that inhabit the house. This is a really good made for tv horror movie and is quite a chiller. Pedro Armendariz Jr. also co-stars in this movie. This was remade by Guillermo Del Toro in 2010 and I have not seen that one. This has a very good look to it, a good feeling of creepiness and is really worth a look especially for horror buffs. 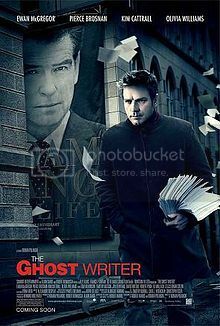 The Ghost Writer (2010): Roman Polanski directed this political thriller. Ewan McGregor stars as the title character who is being hired to complete the memoir on former UK Prime Minister Adam Lang, played by Pierce Brosnan. Lang soon becomes embroiled in a major scandal which then puts the ghost writer's life on the line. James Belushi, Timothy Hutton, Kim Cattrall, Olivia Williams, Eli Wallach, Tom Wilkinson, and many others co-star in this film. I'm not going to go into much more detail as that may give it away. Polanski does a great job directing this and the performances were very good along with the Alexandre Desplat music score which really contributed to this thriller. 3:10 to Yuma (1957): This is my western for the week which was directed by Delmer Daves. Glenn Ford stars as Ben Wade who leads a group of outlaws and he gets captured though the rest of the gang is determined to free Ben. Small-time rancher Dan Evans, played by Van Heflin, is hired to get him to court at Yuma while evading the other gang that wants to free him. Wade is a poor farmer and takes the job for the money but also for money reasons feeling an obligation to help justice happen. Felicia Farr, Henry Jones, and Richard Jaeckel co-star in this western. There are some great interactions between Ford and Heflin. This is one of my favorite westerns from this era and prefer this one over most John Wayne or James Stewart westerns I have seen. This is another movie which has a remake which I have not seen yet but may look into this one soon hearing good things about it. Credit still must be given where it is due so give this one a viewing if you have seen the new one. 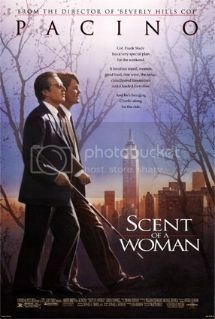 Scent of a Woman (1992): This is part 10 of my eleven part Al Pacino series which is probably the longest I have ever had on this blog. Martin Brest directs this movie based on the novel by Giovanni Arpino. Chris O'Donnell stars as prep school student Charlie Simms who finds an add to look after someone for the Thanksgiving weekend and when finding who he is being hired to watch he finds this is not the simple job he thinks it will be. Pacino stars as Lt. Col. Frank Slade who is now blind and whose family is leaving for Thanksgiving and want to hire someone to make sure he is okay. At first Frank seems very unlikable but slowly forms a friendship with Charlie. Frank unexpectedly decides to go to New York and Charlie reluctantly agrees to go along having quite the life-changing weekend. A young Philip Seymour Hoffman co-stars in this film as one of the prep school students. James Rebhorn, Gabrielle Anwar, Bradley Whitford, and Ron Eldard co-star in this film. Pacino finally won an Oscar after many unsuccessful nominations and does great as a blind man who may not be able to see but knows what is going on around him. O'Donnell holds his own with Pacino. This has some very dramatic and comedic moments like Pacino's character driving a car when he was blind. This is really worth a look. Conversations with Other Women (2005): Hans Canosa directs this independent film which makes interesting use of the split screen. Aaron Eckhart and Helena Bonham Carter star as people who are in a wedding and then begin to flirt afterwards and rekindle on times when they met when they were younger. These people are not given names, they are only credited as "man" and "woman". The split screen method gives different angles of their interactions as well as sometimes using flashbacks. Both actors worked very well together and did a great job of carrying the film and the split screen was very clever as well. This is more of a character driven film that worked very well. 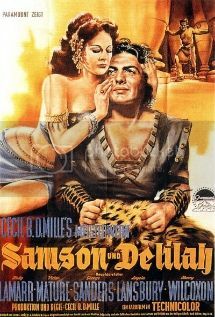 Samson and Delilah (1949): This is my biblical film for the week that was directed by Cecil B. Demille and I suppose you could say this is the first of the Demille biblical trilogy that includes THE TEN COMMANDMENTS in 1956 and BEN-HUR in 1959. Victor Mature stars as the strongman Samson who falls in love with Philistine Semader, played by a young Angela Lansbury, who in turn betrays Samson and is killed in the infighting. Hedy Lamarr stars as Delilah who is the sister of Semander and is determined to get revenge against Samson. She soon has an affair and learns Samson's source of his strength and betrays him to the Saran, played by George Sanders. Henry Wilcoxan and a young Russ Tamblyn star in this biblical film. This was a pretty decent biblical film which had great use of colors as well as good action scenes. The special effects weren't bad for the time. It is also of worth to see a young Lansbury. Out of all three of these biblical films, I liked BEN-HUR the most but favor this one over TEN COMMANDMENTS. 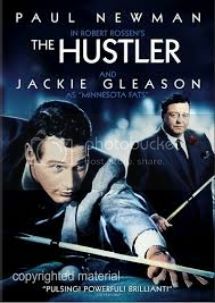 The Hustler (1961): Robert Rossen directed this pool drama. Paul Newman stars as "Fast" Eddie Felson who is a very good pool player but is also very self-destructive. He then meets pool legend Minnesota Fats, played by Jackie Gleason is a more dramatic role than usual, and challenges him to a high-stakes marathon but is unsuccessful. He then goes onto becoming even more self-destructing with alcohol and his lack of confidence. George C. Scott co-stars as Bert Gordon, who kind of takes him in and looks to help him get his confidence back but at the same time is very shady making Eddie realize working with him could cost him his soul. Piper Laurie also co-stars as Eddie's girlfriend Sarah who has problems of her own and is Laurie's last movie until the horror classic CARRIE came around. Look for boxer Jake LaMotta and actor Vincent Gardenia who play bartender roles. This movie at the time started a big resurgence of pool. Newman did not play much pool before the movie but got a pool table and played every chance he could to become good. He ended up doing most of his own shots and Gleason was already a good pool player before the film. This is a very good drama that centers around the world of pool and hustling and one where winning is not always black and white. It also takes a look at the dangers of being a hustler where one does not seem to know when to quit and lacks knowledge of what they are getting into. 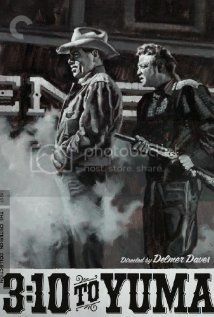 This is a pretty authentic looking film and one of Newman's best in my opinion. 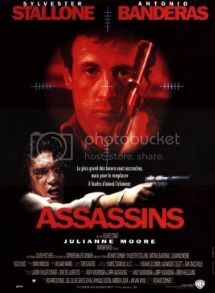 Assassins (1995): I end this week with some action. Richard Donner directed the action movie which stars Sylvester Stallone as burned out hitman Robert Rath who is looking to get out of the business. He finds that will not be easy when encountering another hitman named Miguel Bain, played by Antonio Banderas, who is a young up and comer and wants to make a name for himself. Julianne Moore co-stars as Electra who is a computer hacker and finds herself in the middle of their feud having to stick close to Robert for survival. I don't think I really need to go any further on this one. This is not the greatest movie of all time but a good one to suspend your disbelief for awhile and take your mind off things. Well, that is it for this week. Stay tuned for next week which so far includes more Al Pacino, Matt Damon, and many others.